A great wee run down the Meig Gorge (Am Mòr-Ghil Mhìg in Gaelic) tonight after work; the benefit of light evenings! It’s such a great section of steep-sided, pool drop action paddling. From the get-go, you’re into the action. 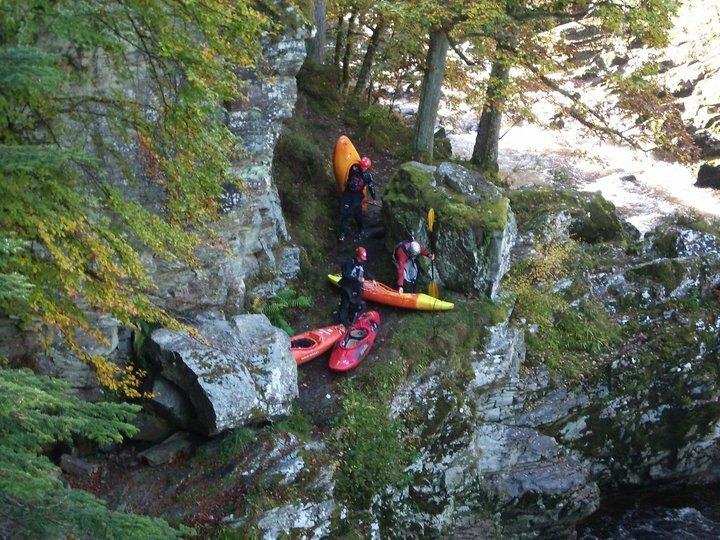 A nice tripple step drop into the gorge, but only after you’ve navigated the weir and its associated metal spikes…this time, m’boat made it through unscathed! Kenny managed to get down the first drop in style, albeit much of it spent under water. He held in for an award-winning period of time, topped off with an eskimo rescue. That guy is a machine when it comes to subaqua paddling; mucho respecto! The rest of the trip was good craic, with some lovely boofs and lines all round. Torq gave the constriction a shot, with Kevin (aka ‘The Stig’) providing a little safety after a serious rock climb down. Anyhow, the next few weeks are going to constitute less ‘me’ paddling and a lot more paddling for ‘others’; the club’s intro spring course is about to start. I always love coaching new starts, reinvesting in the future of the club and putting a bit back into the sport…more kayaking-related feel good factors!